Whether you’re in college and taking a week at the beach or you’re just taking a week off work to get some spring sunshine, it can be hard to know how to pack for spring break. Which shoes should you take? How many swimsuits will you need? Should you pack more accessories? I found that the best way to know what to pack for spring break (or for any week away) is to pick a packing theme. What’s a packing theme? Read on to find out what I mean and what some of my favorite packing themes are for this spring. A packing theme acts as a focus point for making decisions while you pack. In the same way that you would pick a theme for a party and then choose all of the decorations, food and costumes to reflect that theme, a packing theme will help you pack all of the right clothes, accessories, shoes and even make-up for your week away. Perfect for spending a week on a cruise ship or on a beach in the Hamptons, going nautical is a great way to stay trendy and look chic. Think nautical stripes, navy blues and white with a pop of color (I like a cherry red or sunny yellow), and natural make-up with a bold red lip. For shoes, Sperry’s are the preppy way to go for comfortable flats but for occasions where you might want to dress up, espadrille wedges or leather sandals are equally in line with this theme and will keep you looking classy shoreside. Thinking of spending your week at the Florida Keys or in the Bahamas? Think tropical and you’ll be sure to pack lots of bright whites and bold colors. Fuchsia, turquoise, orange and yellow are great colors that keep things sultry and can match well together. Consider loud prints and lots of color blocking as well. Leather flat sandals are the way to go with this theme with stilettos in a metallic color for fancy nights out. You might not be tan now, but you will be soon so look for colors and textures that will complement your tan and keep your skin glowing late into the night. A two-tone packing theme means you can pack less because you’ll be able to mix and match separates to create your outfits. A black maxi dress can be dressed up for a nice dinner while a white tank top paired with black shorts looks classic and neat for when you’re shopping. Don’t forget to include black and white prints to your outfit selection for a more interesting mix. Black pointed flats can be worn casually or dressed up and white sandals will look great by the pool or on the dance floor. And since your outfits will be in black and white, go bold with your accessories by choosing pieces in bright colors. Where last spring saw the safari theme on the rise, this spring it’s all about a tribal feeling. Think tribal prints and rich shades of red, green and purple. 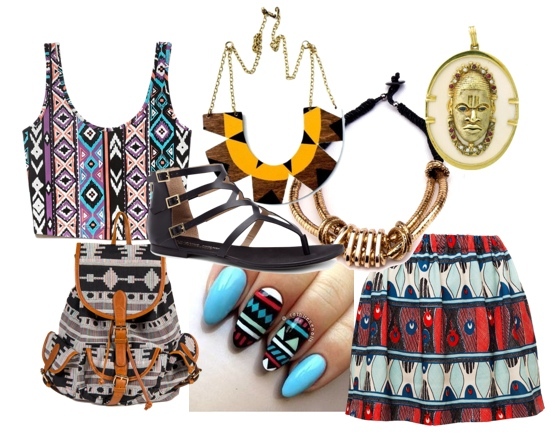 Tribal is all about bold colors, prints and accessories. Tortoise shell bangles, metallic gold earrings and ivory-hued pendants will really set your outfits apart with this theme. Keep things fun with tie-up sandals and don’t forget to paint your nails a bright hue to keep everything together. Whatever you choose, remember to stick with your theme. It’ll keep your packing to a minimum and give you the highest chance of being able to create outfits as you need them because you know everything will match. Throw in a matching clutch or tote as your go-to bag. Then get ready to spring break in style! Life With Excessive Sweating: What Causes Pit Stains, B.O., and Can It Be Stopped?